"This vegetarian bowl version of the beloved Vietnamese banh mi sandwich gets its protein from quinoa and has a kick from a spicy vegetarian mayo sauce." Pour 3 quarts water into a saucepan and add boil-in-bag rice packets. Bring to a boil. Cook, uncovered, 8 to 10 minutes. Remove bag using a fork and drain. Pour cooked rice into a bowl. Pour 1 quart water into a saucepan and add boil-in-bag quinoa packet. Bring to a boil. Cook, uncovered, about 10 minutes. Remove bag using a fork and drain. Pour cooked quinoa into a bowl. Place cucumber, carrots, and radishes into a bowl. Combine vinegar, 1/4 cup water, sugar, sesame oil, and salt in a small saucepan and bring to a boil. Pour mixture over the vegetables in the bowl. Let stand 20 minutes, then drain. While vegetables are pickling, combine mayonnaise and sriracha sauce in a small bowl. Stir until well combined and refrigerate until ready to serve. Add 1 cup cooked rice and 1/2 cup cooked quinoa to each of 4 bowls. 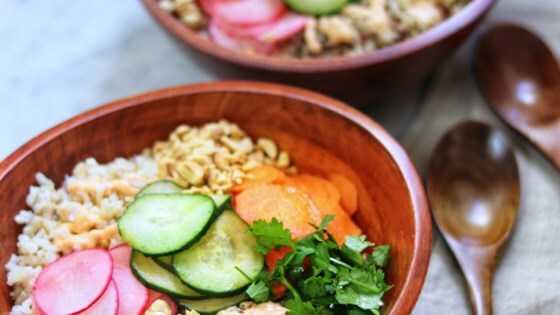 Divide sriracha mayonnaise evenly between the bowls, drizzling over the rice and quinoa. Layer pickled vegetables on top and add 2 tablespoons each of the chopped peanuts and cilantro. I used 1 packet of boil-in-bag quinoa (1/4 of a box) and 2 packets of boil-in-bag brown rice (1/2 of a box).